I was distressed this morning to read that Pope Benedict will be stepping down. I love Pope Benedict. Interesting, the word is that he is the first pontiff since the Middle Ages to step down. Surely now there will be some discussion about the last pope to step down, and who he was, and why he did it. That will be fun anyway. I love when the Middle Ages suddenly become relevant! For instance the story about Richard III, I cannot step away from that. How they found his bones after all these years. And all the arguments about where he is to be buried now, and what kind of memorial is he to have, Church of England because that is what English royalty are now, or Roman Catholic because that was technically what he was. The best debate I found on the Internet was about, if Richard III had a Catholic funeral, shouldn't it be the ancient Latin rite, because that is what the king would recognize. Surely it should be! I know what side I am on in that argument. Plus it is great to be debating what Richard III would want. Oh well. I could go on about this forever. I have already listened to the show on Richard III by NPR's On Point. Do click on that link. They have a Richard III Gallery! I have watched parts of Shakespeare's "Richard III" as portrayed by Sirs Laurence Olivier and Ian McKellen. And read the beautifully written assessment of Richard III by the great G.K. Chesterton. I love him because, among other things, he loves the Traditional Latin Mass as I do and also he plays classical piano and is darned good, if reports are to be believed. You have to figure he is familiar with Leonard Pennario because Pennario played a lot in Germany. He loved German audiences and they loved him there. But now that I am thinking over this resignation I am seeing a bright side. I think the Pope wants to make sure that the right guy gets his job. He is wise and these are challenging times for the Church and I bet he wants a hand in the decision as to who his successor will be. Then he wants to be here to make sure the transition goes smoothly and his reforms move forward. So that makes me feel better! What I am dreading though is all the ignorant, hate-filled commentary we are going to be seeing on the situation on Facebook, on Twitter, in anonymous comments, in newspapers, on the radio, everywhere. It will be going on for weeks. I made the mistake of glancing at the comments on the Yahoo News story. It was like opening the door to hell! So this is going to be a long next few weeks. And, you know, I do not get this, this hatred. You've got doubts, you're a different religion, you're an agnostic, you're an atheist, you're searching, I get it, I understand. What I do not understand is all the hate and mockery. It's just evil. All I can picture is a bunch of demons like out of Hieronymous Bosch! Hahahaaa... That felt good, letting that out! 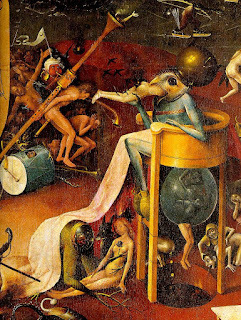 Plus, any day you can mention Hieronymous Bosch could never be a completely bad day. It counts double if you can mention Hieronymous Bosch before you have had your second cup of coffee. Which I was just able to do. Surely that is a good sign! I dreaded looking over Facebook this morning after hearing the news because of the mean comments you mentioned in this post. I actually deleted two people from my account. Lent already brings with it a very strong anti-Catholic sentiment (as I have experienced year after year) and this news adds fuel to the fire. Like you, I don't understand where people feel the need to spread such hate. There are many religious figures, peoples or aspects of beliefs that I dislike, but out of respect, I do not make unkind commentaries about them. Respect goes further than hate.